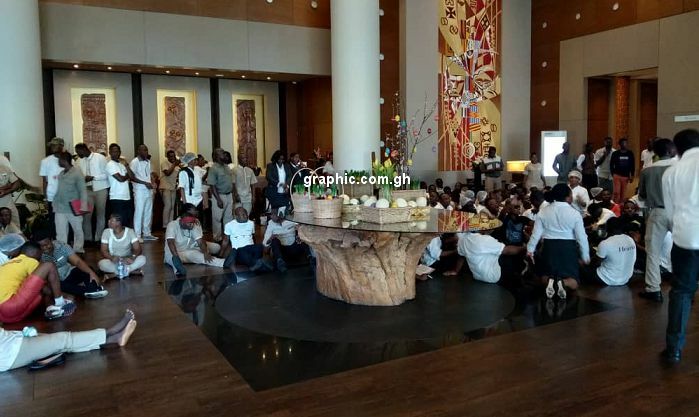 The staff of Mövenpick Ambassador Hotel in Accra have laid down their tools to protest against what they describe as racist treatment by the management of the hotel. According to the Ghanaian staff they have been at the receiving end of racist treatment from some of their bosses. To protest this treatment, about one hundred staff were chanting wars songs and drumming at the reception of the hotel on Wednesday (April 17, 2019) afternoon. Speaking to Graphic Online, some staff alleged that Ghanaian workers were treated harshly and dismissed by the management when they misbehaved. They said some of their colleagues have been fired for petty crimes such as stealing pens while expatriate staff went unpunished when they stole from guests. They said that they will not return to their various post until the General Manager of the hotel Michael Rathgeb – who allegedly oversees the racist treatment is dismissed. This has left some guests of the hotel stranded since there is no staff to assist them. Most of the guests have therefore joined the media to witness the demonstration. BISSA reached out to the management of Movenpick but they declined to comment. They indicated that they will issue a statement at the right time on the matter.